I ran a small lot on Ebay (a guided day on the river Test at Broadlands) to raise money for the Royal British Legion, there are many worthy causes out there but this one is very close to my heart. The Army has provided me with a living my whole adult life and I am grateful for it. It’s only fair that if you can you should try and put a little something back. The Royal British Legion is a UK charity providing lifelong support for the Royal Navy, British Army, Royal Air Force, Reservists, veterans, and their families. I am grateful to the Broadlands Estate and Jon Hall who agreed to host the day free of charge, so all the money could go to the charity. 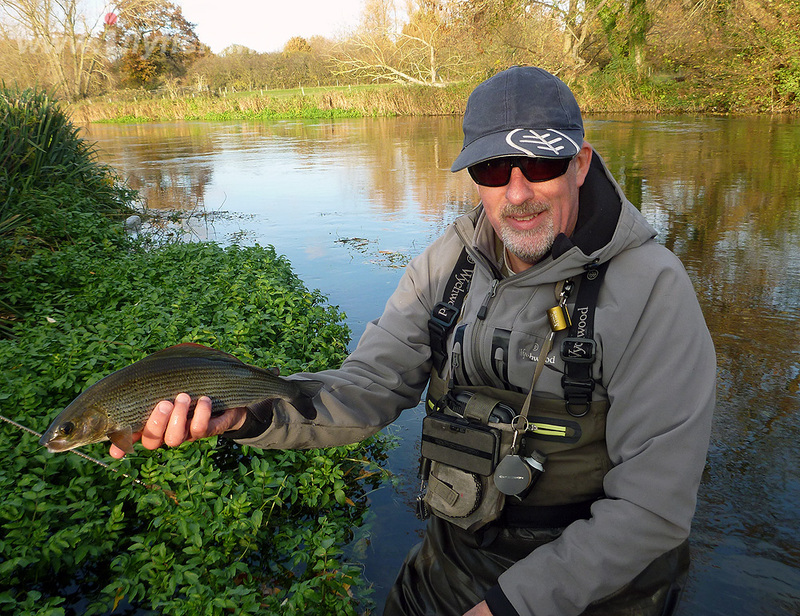 The winner on the day was Sean Doyle a fanatical angler and a recent convert to Grayling fishing. A happy coincidence he lives less than two miles from me. I arranged to pick him up from his house at 0700 and we made our way through the morning traffic, river bound via McDonalds for a bit of breakfast. I had checked the weather forecast and the day promised to be a mild one. The river looked in fantastic form. 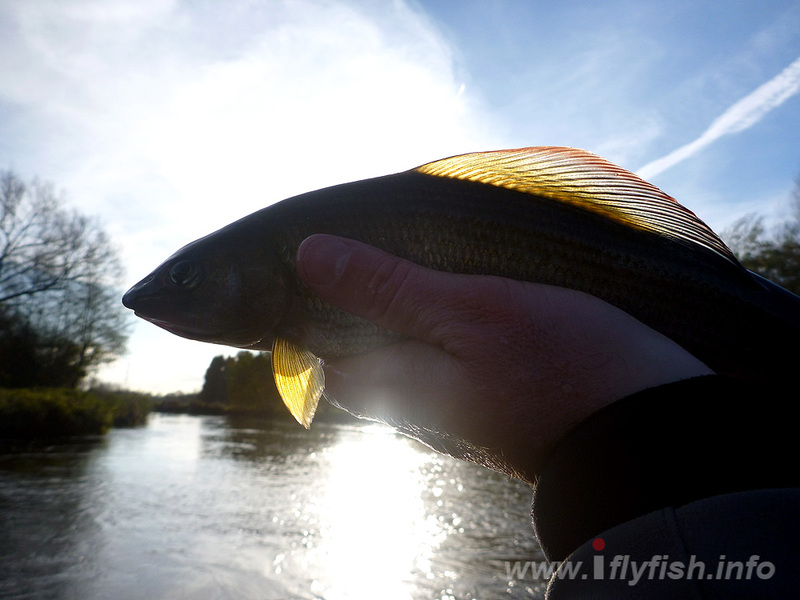 It was a little higher than it had been for the Grayling Classic but was running fairly clear. For those not fortunate enough to have visited this fishery it is for my money the premier Grayling river in the South East bar none. 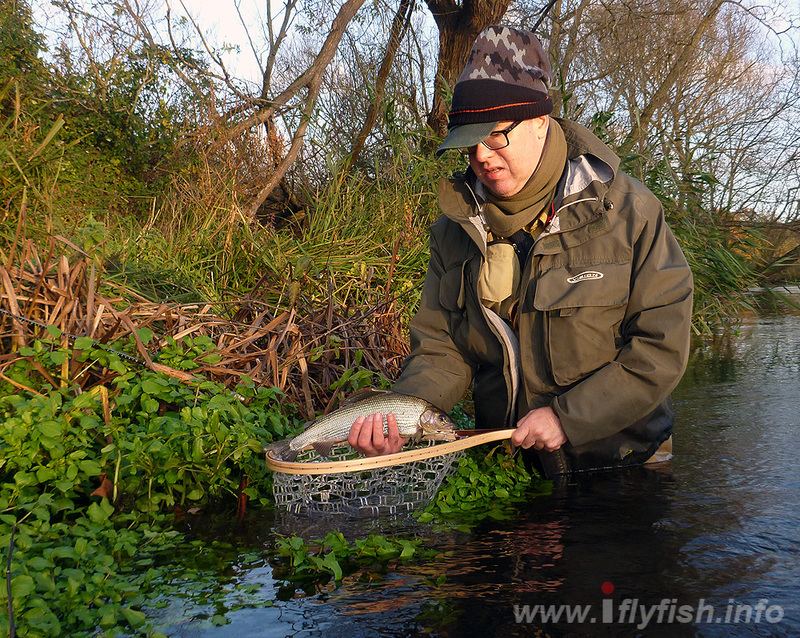 The river keeper (Jon Hall) is a hugely accomplished angler and is always on hand to offer advice to those who seek it. The first thing we did was set up the double nymph, although Sean had already fitted a French Leader to his reel it was lacking an inline indicator. I had already prepared an indicator that we attached to his line. We had a short discussion on fly choice, distances apart, weight and the theory behind these choices. 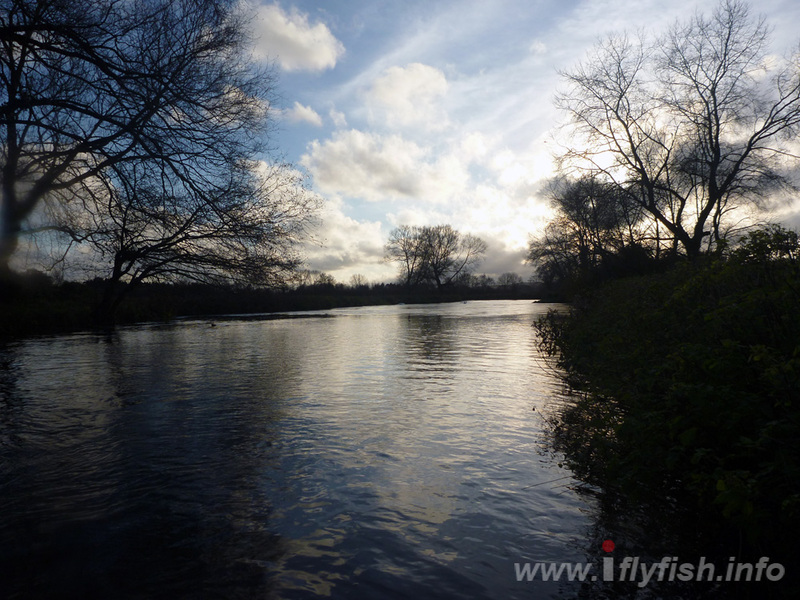 Sean was keen to improve his accuracy when casting and this was an area we would concentrate on initially. He was using a Snowbee Prestige 10’ for a 2 wt a decent starting point for nymphing. I decided to start at the very bottom of the beat as I had enjoyed a fair amount of sport there last month. I would like to tell you that I stepped into the river to demonstrate the technique and had one first cast. But this is real life I didn’t have one even after three or four casts! It was time to get Sean fishing, so I brought him into my footsteps and set him off. He was having some problems with getting the flies to go where he wanted, and this was mostly down to him being used to working a traditional floating line. After a very short time he was flicking the nymphs around like an old pro. 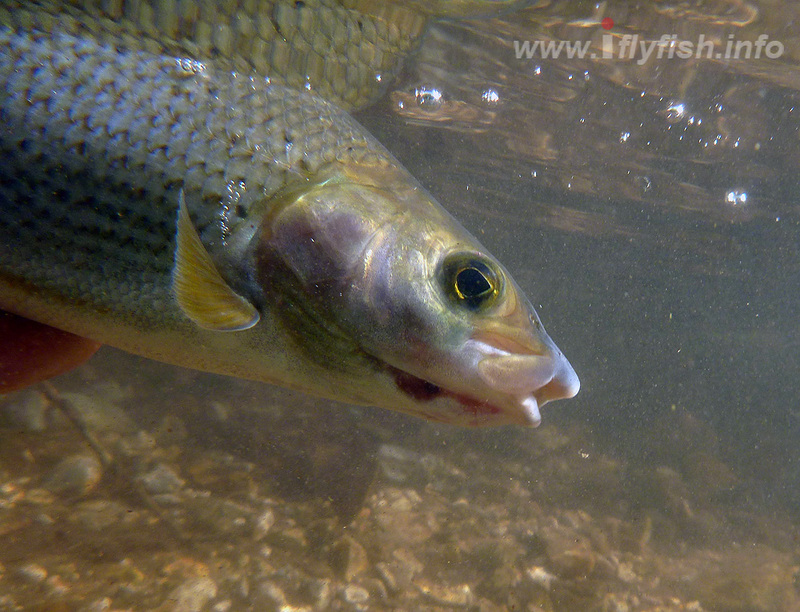 The Grayling were conspicuous by their absence, it had not occurred to me that the fishing maybe tough. I was starting to feel under a little pressure for Sean to catch a fish, he was doing everything right, but the fish were not forthcoming. I have always found Broadlands to be a slow starter, but the weather was super mild and I was getting worried. This must be what professional guides go through when they are out with clients. I left Sean in the honey hole and went upstream a little to prospect for some fish. I bumped a fish and immediately called Sean up to have a go, where there is one there are many. It was not long before Sean safely landed his first fish of the day and it was of a decent stamp. I was relieved he was of the mark and we moved steadily up the river dipping in here and there for not very much return. 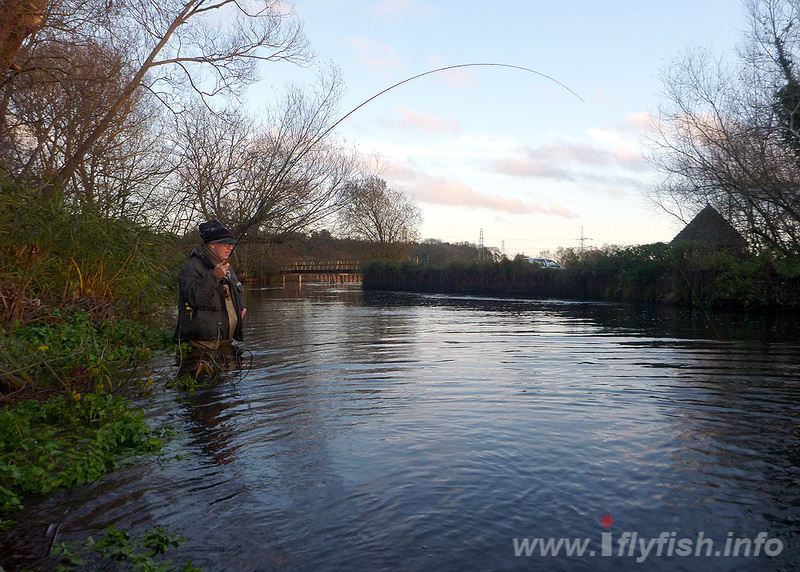 As we approach the car Sean fancied a go just below the bridge and was rewarded with another clonking fish. 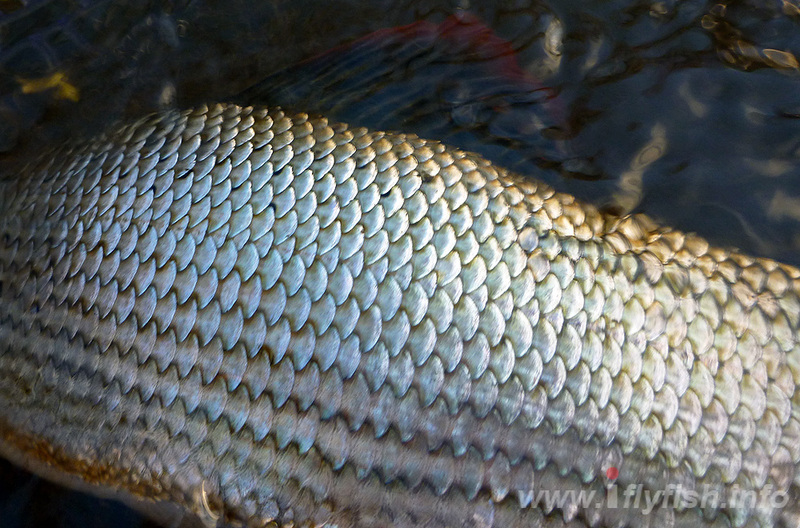 The overall stamp of fish this year has been outstanding! We moved above the bridge for a quick dabble before lunch and things picked up. Several fish gave themselves up to our nymphs again all a reasonable size. We had a break for lunch discussing fishing, fly tying and mutual acquaintances. After lunch we carried on fishing upstream around the island usually a prolific area it produced a few fish but not the bucket loads that I know lives there. Time was wearing on and the I was keen to show Sean as much as I could in our limited time, so we moved up further to another mark. Again, the fishing was tough but when you did pick one up they were crackers. The light was starting to fade fast so I suggested a return trip to where we had enjoyed most of our sport. We stood chatting and fishing together Sean took a lovely fish that he reckoned was not too far from his PB. I was getting the odd fish while keeping an eye on Sean when I see him strike and the rod buckle over. The fish did not come to the surface quickly and as I moved across the two or three steps towards Sean I could see the tip of the rod springing up and down as the fish on the end shook its head in fury. I said to Sean that’s a Brown trout or maybe a Sea Trout. The fight was lengthy, but Sean played it like a pro. 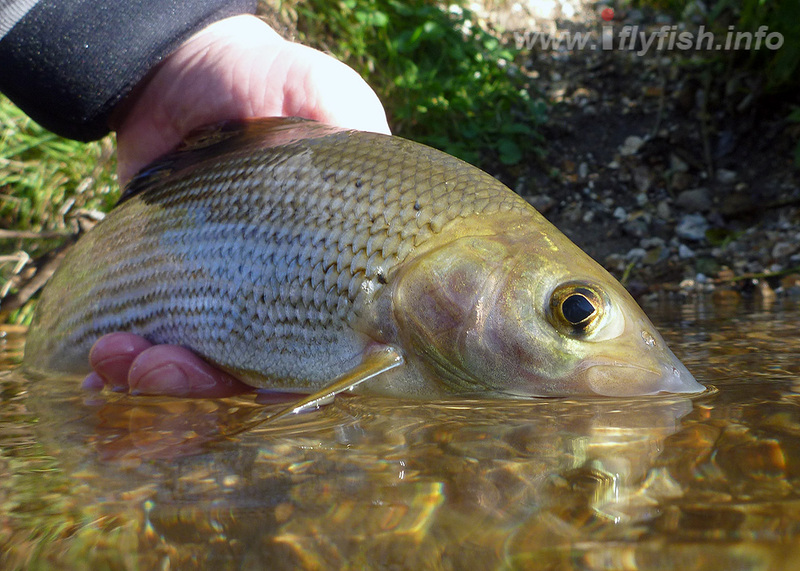 As the fish yielded and came near the surface I saw an enormous dorsal fin stood to attention and watched as a huge Grayling erupted on the surface! My heart was in my mouth for the briefest of moments until the fish succumbed and Sean guided it into his waiting net. It was a beast, I measured it against the tape on my rod quickly and it was at the very least 45cm. In hindsight if I had taken more time I now think the fish would be nearer the 47cm mark. Needless to say, Sean was buzzing having smashed his PB, and I was over the moon what a great way to finish up the day. 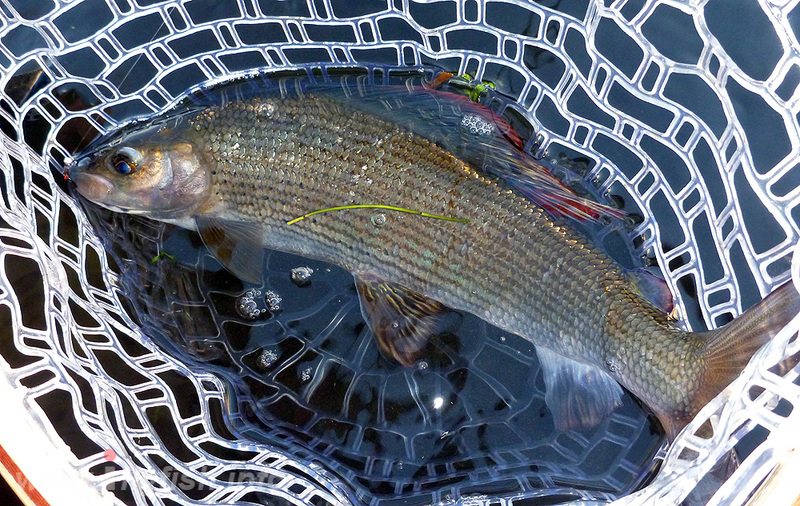 We pottered on for a bit and I had another lump of a grayling but not nearly as big as Sean’s fish. Jon Hall popped to see us to see how the day had gone and have a general chat, but the heat had gone from the day. I could barely make out my indicator and we called it a day. I have never really guided anyone before and was keen to get some feedback from Sean. He assured me that he had really enjoyed the day and learned a lot. It was heartening to receive this message from Sean which I hope he does not mind me reproducing here.